Amazon FBA is a service Amazon offers to help you save time by having Amazon do the work of handling packages, delivering them and even picking them up for you. They also offer the service of dealing with customer service and returns for all Amazon.com orders. All listings get the Prime logo to boot so customers know the orgers have gone through the Amazon Prime FBA service. Once you register, you are allowed to list items for sale in the Amazon Marketplace. When your product is a trustworthy brand, you will be automatically connected with millions of potential customers to complete your sale. Once your order if picked up for a sale by a customer, choose Fulfillment and Amazon FBA will complete she shipping process. Amazon fees are built into the Amazon referral fees which is them taking a cut for about 15% which varies by item. Costs for receiving your item and putting them in FBA storage is about $1.00 depending on the item size and value. The Amazon FBA online sales model offers a base payment model of $39.99 per month which allows you to sell unlimited products with the full support of Amazon’s provided services that come with the program. This business model is good for businesses that are shipping a lot of products per month while small businesses shipping less than 38 may be better off with the individual FBA plan which only requires customers to pay $0.99 per item sold with no base fee. Products are available in more than 20 categories while another 10 gategories are available to Professional Sellers who meet Amazon’s necessary requirements. Approval is required for selling automotive and power sports equipment, beauty items, clothing and accessories, business products (also known as B2B selling), grocery / gourmet food, luggage and travel accessories, jewlry, professional services, shoes handbags, sports collectibles, video/DVD/blu-ray, video games and video game consoles as well as one. Amazon FBA changed its Fulfillment by Amazon U.S. costs on February 22, 2017. The consolodation costs which they refer to as their ‘pick & pack’ service includes Weight Handling fees and was combined with single per-unit Fulfillment Fees when the change was put into place. For the seven plus months until holiday season, or beginning on October 1, 2017, the Consolodation of Fulfillment Fees and Alignment of Q4Fulfillment Fees will remain the same. Monthly Inventory Storage Fees will increase for standard-size as well os oversize items and these will remain the same for November and December. Seller Shipment Requirements beginning July 19, 2017 will give you the option of following Amazons guidance or using the Inventory Placement Service which is hindered to lesser destinations for completing your sale. Per-item fees come into play when you use the Inventory Placement Service. There used to be an Elimination of Zero-Fee Fulfillment fee in place for standard-sized items for $300 or more, but this has been discontinued and fees will come into play in future sales. The FBA Fullfilment process allows for customer service and returns and supports business growth through its program. They pride themselves on taking accountability for your inventory as you can send as many units as required. Their Multi-Channel Fulfillment program allows customers to fulfill orders from various sales channels and use inventory saved in Amazon fulfillment centers. Amazon can also return inventory to return fulfillment centers at all times. A simple online interface allows you to use Amazon to manage inventory. Amazon FBA Fulfillment Fees for standard-Non-Media items which includes Order Handling, Pick & Pack, and Weight Handling Fees at a per-unit total before February 22, 2017 came in at $2.56 for small-standard size (l 1b. or less) for January-October, $3.02 for large standard-size (1 lb. or less) items and $4.01 for large standard-size + $0.39 per extra pound (1 to 2 lbs.) items. Large standard-size items will ship for $3.72 plus an additional $0.35 per pound after the first 2 pouns during holiday season (November-December), $3.72 for large standard-size items, $2.88 for large-standard size (l lb. or less) and $2.53 for small standard-size items during the holiday time period. Standard Non-Media Fees dropped after February 22, 2017to $2.53, $2.88, $3.72 and $3.72 + $0.35 per pound above the first two pounds for the fee listings above respectively of small standard-size (1 lb. or less), large standard-size items (1lb. or less), large standard-size (1 to 2 lbs.) and large standard-size over 2 pounds. Amazon FBA Fulfillment Fees have gone down for standard Non-Media items from January-September post February 22, 2017 to $2,41, $2.99, $4.18, $4.18 + $0.39 for the respective categories listed above. For the holiday season of October-December effective February 22, 2017, prices have dropped to $2.39, $2.88, $3.96 and $3.96 + $0.35 per pound above the first 2 pounds respectively to the items listed in the paragraph above for Non-Media items. Rates for shipping Media items have actually risen since February 22, 2017. This has happened because these media items are built into the algorithms Amazon uses to make the Amazon FBA calculator business model one that is profitable to Amazon as a company. Amazon offers customers a free calculator that was created to estimate the fees for whatever it is a customer is mailing to provide an estimate for what the costs for mailing a given item will be when considering becoming a customer. The Amazon FBA calculator helps small business owners to calculate bottom-line profit estimation between FBA and said merchant who is analyzing if selling goods through Amazon is worth it or not. Once you are a customer, Amazon offers more sophisticated technology to analyze if Amazon FBA is a good business decision for you. Pick & Pack refers to Amazon handling the business of retrieving your item you are selling from the warehouses, packing them with any packing materials necessary and handling the labor of shipping them out including putting the necessary codes on them. This is a large part of the business model for the Amazon FBA Fulfillment business offering because the service they are providing is taking your item, storing it, then providing it to your customer, so you as the small business owner can focus on the importance of producing more business while past sales are being taken care of by a third-party (Amazon). Weight Handling is what Amazon uses to refer to calculate shipping costs based on the weight of a given items. The weight determined here effects how the item will be evaluated by the Amazon FBA calculator, i.e. as a Non-Media Item or a Media item and based on their weight what the item will be sold for. Order Handling is another factor in the Amazon FBA calculator and it refers to what the charge will be for FBA physically receiving your item and putting it in their warehouse storage. Warehouse storage fees based on the size of your item and the value, i.e. if it is a non-media item and if it is expensive or not. Inventory Storage is offered by Amazon and they do this if, for instance, a customer who is abroad decides to buy an item, but they cannot pick it up until they return from a trip abroad. They will store your item each month and charge you on a monthly basis by each cubic foot your item takes up in their storage space. Storage for under 2 pounds is $0.64 per cubic feet and $0.43 per cubic feet before October. Then during October to December it is $2.39 for oversized items above one pound, it is $0.35 per pound above first two pounds; 1 pound or less standard-size is $2.88, 1 pound to 2 pounds standard size is $3.96 at one to two pounds and over two pounds standard size is $0.39 per pound above first two pounds. Small oversize is $0.35 per pound above first two pounds, medium oversize above two pounds is $0.35 per pound above first two, large oversize at above two pounds is $0.80/pound; above first 90 pounds for large oversize items is $0.88. The profit dashboard Amazon created provides its customers with a dashboard broken up into three columns. The Gross Sales column will track your units and orders while the costs section will break down costs into costs of goods, shipping costs, Amazon fees, FBA fees, taxes and so forth with the last column putting these items together to give customers their profit, or profit margin. This helps to make decisions in real time with live sales data. 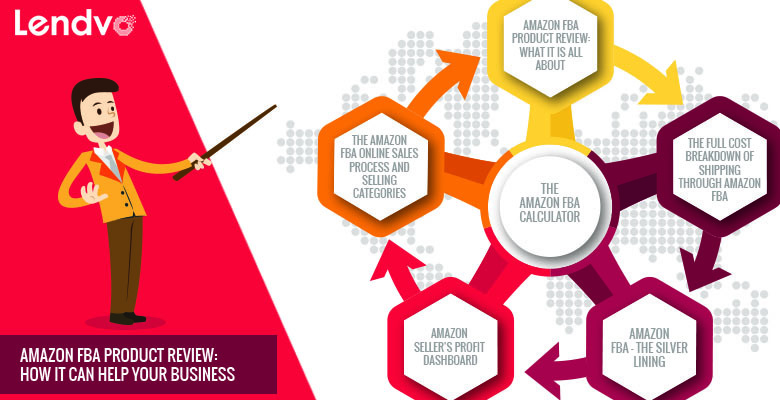 In order to look at the Amazon FBA business model as both a prospective customer and merchant, we had to take all of the information under review and analyze how it could be successful for certain businesses and unsuccessful for others. If you are running an online retail store that is shipping thousands and thousands of non-media products at a moderately priced dollar amount (therefore allowing you to pay less for shipping per each item), this means that your profit margin will be higher by having Amazon deal with the shipping process rather than you dealing with the shipping process on your own time while simultaneously trying to produce new busines. A silver lining can come for the business where Amazon’s new rates built in in 2017 may be profitable for certain businesses, like the sample business just discussed selling non-media products and profiting year around. This same company may be selling the same products at even a 33% larger scale, but the fact that the rates have become so much higher with Amazon FBA calculator’s new structure may hurt these businesses because the rates they are paying rising will decrease the profitability of each item and therefore decrease the profitability of said company in the last quarter of the year which is a very important time period of the year. Amazon knows exactly what it is doing as a business by raising its fees from October to December because businesses using Amazon’s FBA service will use their service more than ever in the last quarter of the year because this is the biggest consumer consumption time period of the year since people are buying gifts for their families at this time. This is also bonus season for a lot of employees so purchase power is higher for the U.S. customer base. Amazon will find it very profitable during this time of year as it has in the past. So, an idea is that if this is the case for your business finding profitability using Amazon before the last quarter of the year that you may not find at the last three month period of the year is for Amazon customers to end their membership once the end of the year hits. By doing this you will be able to profit off ot he lower prices Amazon is offering which began on February 22, 2017 of this year while decreasing losses in the fourth quarter of the year, by maybe putting in the work of packaging and shipping business sale items yourself to your customers. This is not to say you cannot use Amazon Prime during this time, but rather you can package the items and use Amazon Prime while offsetting the costs of using the Amazon fulfillment program. Therefore you will not be giving up the 15% profit during the most important business sales time of the year, but rather you will be making the sales and raking in the necessary profits you need to create a successful beginning to your sales stream for the upcoming year when you begin to use Amazon’s FBA fulfillment program again.